Even though the winter holidays are officially in our wake, it is important to remember the roles that family, friends, and food play in our everyday lives. After all, aren’t the “simplest” joys truly the best? But with the chill of another Northeast winter upon us, some of us might find it difficult to get into the celebratory mood. Should you find yourself bogged down by winter’s doldrums, shift your focus from the arctic cold to the comforting embrace of your own home. There, you’ll find all the warmth you need to get through the cold, dreary days ahead. Besides hunkering down, winter is also the perfect season for crossing off some of the items on your to-do list of home-improvement projects. Maybe you’re looking to turn your home into an indoor-entertainment mecca. Perhaps it’s time to finally jump into a kitchen renovation as a way to facilitate entertaining and meal preparation. Or maybe home automation is in your future, as a way to safeguard your home, protect your family, and attain peace of mind. No matter the goal, now is the time to act. 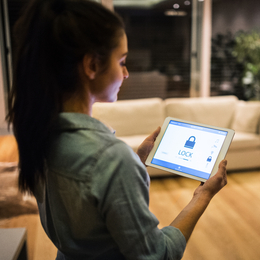 Smart-home technology adds simplicity and security to everyday life. Scenario: Saturday finally arrives after another hectic workweek, and you’re in a mad rush to shuttle your youngest child to a swim meet, a 40-minute drive away from your front door. Once you hit the highway, the doubts begin to creep in: Did I leave the lights on? Did I set the alarm? Did I lock the front door? Previously, one might have had to turn around and double check, purely to calm the nerves. But these days, as with most things in American life, a homeowner can have peace of mind simply by reaching into one’s pocket and checking his or her smartphone. Dennis Mathew doesn’t see himself as the kind of guy who buys all the “latest and greatest” gadgets, but he does like tech. So it’s no surprise that he speaks so highly of Xfinity Home, a tech-rich service from Comcast that enables him to safeguard his Bucks County home and the people who live in it. Factors such as the advent of approachable technology and the increasing amount of time Americans spend away from home are driving consumers’ hunger for such services. By the end of 2018, U.S. homes had more than 45 million “smart home devices,” according to research from the market and consumer data firm Statista—and the adoption of such technology is expected to continue its steady ascent in the years to come. Mathew suggests he has as many as 50 different devices connected through Xfinity Home, ranging from cameras and motion sensors to lighting, door locks, and smoke detectors. He says the service gives homeowners such as him just one less thing to worry about. Besides giving Mathew the ability to receive real-time alerts regarding anything out of the ordinary, and enabling him to remotely arm and disarm a home-security system through his smartphone, Xfinity Home enables him to essentially monitor and control the home from anywhere. No matter his physical location, he can turn on the lights, control the thermostat, or check a live video feed to, say, make sure the kids have arrived home safely. For those who may be less comfortable with technology, Mathew says Comcast designed the system for ease of use. In addition, the combination of professional installation and intuitive design, as well as a host of tutorials and “digital assets,” should make using the system a cinch even for the tech averse. “The home-automation capabilities help to simplify some elements of life,” Mathew adds. “Life has gotten more and more stressful in terms of people always being on the go. Having the automation capabilities—automating lights and cameras to make sure things are OK when you’re away from home—it just becomes part of your day.